I really enjoy my Facebook page and would love to see you there! Keep up to date with our latest homeschool news. Get inspired. You'll find I love quoting some of the great sayings which remind you why homeschooling is the best choice for your child. Find links to interesting sites which will help you homeschool. Meet other people who enjoy homeschool activities. Help and be helped by others with advice and support by commenting on posts. "Talk" to me! Use Facebook to ask questions and share activities. Come and join! Just LIKE our Facebook page and you'll be up-to-date with all the most recent news at homeschool-activities.com. 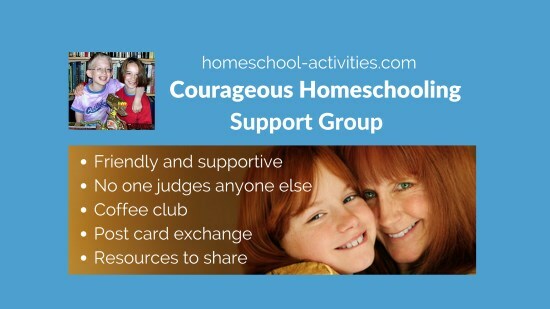 "This is a great FB page for positive comments on homeschooling,"
You can also join my smaller Courageous Homeschooling Facebook group, which is a support group where we share the ups and downs of our homeschooling days and give each other encouragement and help. You can join the Post Card exchange, enjoy free resource files and we even celebrate each other's Birthdays! 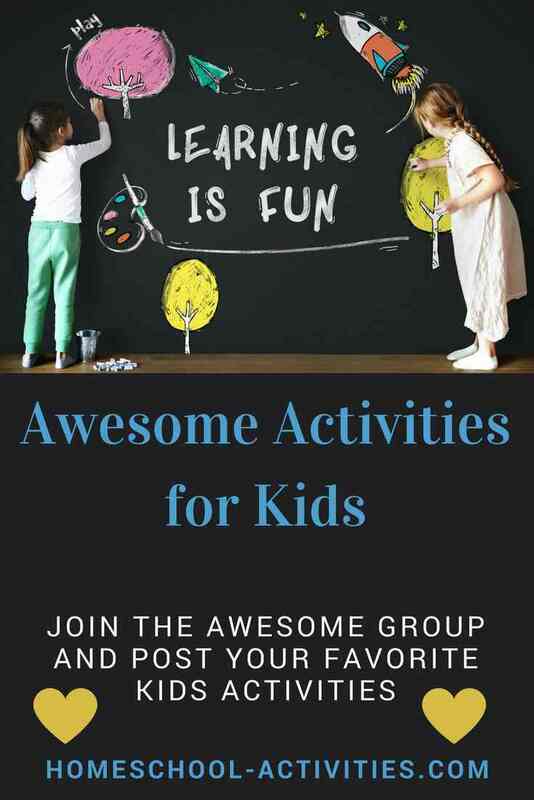 I've set up an Awesome Group board on Pinterest for you to post YOUR favorite kids activities. Just contact me and I'll add you to the board. My Blog is a great place to find all my latest pages and important updates. My site is now pretty big and getting bigger all the time so you'll find my Blog works really well to keep you up-to-date. I also find it very useful as a way to talk straight to you if there is something urgent I need to say. To subscribe to my Homeschool-Activities Blog (no e-mail necessary), RIGHT-click on the orange RSS button (see bottom buttons on the left-hand column) and then copy-and-paste the URL into your RSS reader. Or click on the Google, my Yahoo!, my MSN or Bloglines button if you keep a personalized home page there. Follow their instructions. 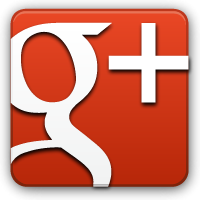 And you can also see our latest homeschool news and updates on Google+. So you have lots of ways to keep in touch!